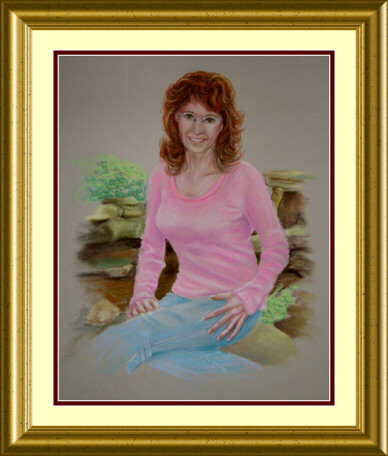 The painting shown here is of my friend Lee Ann. 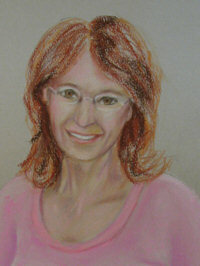 It is done in pastel and is 20 x 16 inches. It was painted, (pastels even though done in chalk are often called paintings and not drawings) from a large number of photos. Lee Ann is a lovely lady I met on MySpace as a friend. We got to know each other over several months of emails and phone calls. As I got to know her better I wanted to paint her. I asked for more and more photos of her and she even took some especially for the painting. She wanted to be painted as she really was. She is a lovely lady from Kansas whom I have never seen in person and probably never will. This is the first time I have ever painted a portrait of someone I have not met. I don't think I would ever do it again because it is so hard to get the likeness correct if I don't see them. She was just special and we had gotten to know each other so well I felt, with her help, I could capture the lady I know her to be. Normally I would take several photos, perhaps 100 but I would be taking them and talking to the sitter and getting to know facial expressions and more of an understanding of her or his face and body. I did some sketches and sent them to her. With several phone calls and emails we finally agreed on a pose. 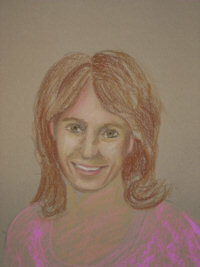 I drew from the photos on what is a special gray pastel paper. I knew I had to get the face at least almost right before I could go on with anything else. If that isn't right the rest just isn't important. Whenever I do portraits, rather pastel, or paintings in oils I always need to get the basic face to where I think it looks like the sitter before I move on. That doesn't mean done but just the structure and initial shadowing. Lee Ann sent me several photos of herself in front of the fishpond she built several years ago with the help of her, then, two small sons. It has great sentimental value to her. The boys are since grown. (Yes, can you believe it? She looks like that and has two grown boys!) It is a very beautiful pond with goldfish she admits to talking to when she feeds them. That is what is behind her in the painting. She wanted to be painted in jeans. She explained that was who she was. She is a lady who can look great in an evening gown (I saw the photos, believe me.) but the real Lee Ann is jeans and boots. Hey, it's Kansas, and she likes a good steak. Anyway, she was very clear she had no interest in being painted as I do my models. 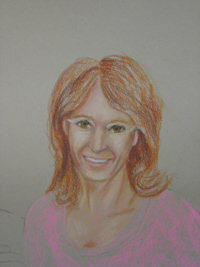 I do several portraits in pastel or oils and most are done with a setting much as you see in hers. It is working with my models here in the studio that creates the other works. I photographed the painting as I went along and every night we would talk and she would explain what she liked and what was wrong. She is such a kind person it took all she could to tell me when she found something wrong about the hair or eyes and then had to apologize for several minutes for mentioning it. She is too kind for her own good, but I wish every woman in my life were like her. 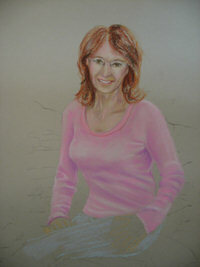 You can see from the images of the stages how the painting progressed. I did the figure, nearly finishing it, and then went on to the background. The last thing was back to the face and hair to get that just as she said she really looked. We struggled over the eyes and hair for a couple of nights. I guess the highest compliment I could be paid was for her to tell me it really did look like her. She is very kind and generous but I know her well enough to know she wouldn't say that unless it was pretty close to true. 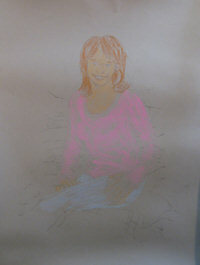 The matting and frame you see on the final painting were added and it is now sent off to her. I'm told it will hold a place of honor on the wall of her bedroom. What more could a painter ask? This is so beautiful. I can tell you captured what a wonderful person she must be. I'm going to use your contact form to ask more about commissioning a portrait of my daughters. Thank you for all the information. The story was fun.